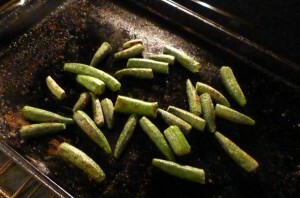 I went to the Google Gods and found that roasted okra is just about the hippest thing around. Great and my okra plants just froze to death. But never fear! 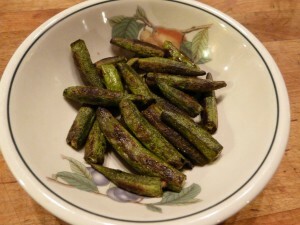 I still had a bit left in the fridge, so last night I tried Roasted Okra and I’m definitely a new fan. Though this isn’t your classic Thanksgiving Day recipe, it sure would make a great snack while watching the big game. It’s nice and crunchy, you can spice it up anyway you’d like and the slim is nowhere to be found. Plus, it’s incredibly easy. And that’ s the best part. 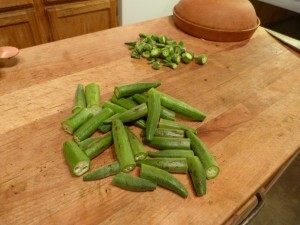 Like I said, I didn’t have much okra left and next time I’d make a whole bunch at one time. Preheat the oven to 450. Then cut off the pod heads and ends. On the smaller pieces, I didn’t even cut off the tiny tip end. 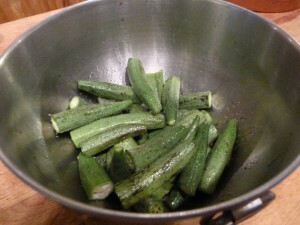 I also took the big long okra that sneaks up on you and cut it into large chunks. Tasted just the same and I didn’t have a problem with it being stringy. Then, simply drizzle it with olive oil, toss and add salt and pepper. 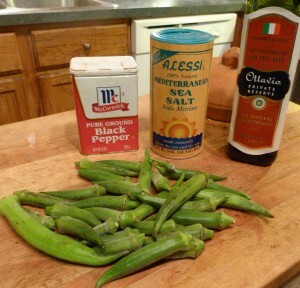 I find the Sea Salt holds on to the okra much better. You could also add chili pepper or any other seasoning that you like. Then, spread it out on a pan. Roast it 7 minutes and then flip all the pieces for even browning. See how it’s browning up? Then cook another 8 minutes or so until you have both sides nice and brown. Pull it out of the oven and serve it up. You can use this as a side dish, a snack or even on top of a salad. Just great! Preheat oven to 450 degrees. 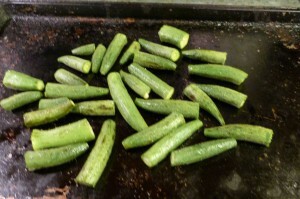 Trim ends off okra. Toss with olive oil, salt and pepper. Roast for 15 minutes, turning to insure evening browning. Serve immediately. Since next week is Thanksgiving week and most all of us will be hither or yon, I’ll do my column on Monday and then a few fun Thanksgiving things for the rest of the week. Enjoy your holiday, drive safe and eat as much as you want. Just don’t forget to keep laughing through it all! Spreading okra throughout the world…one crunch at a time.